﻿ How to Use Your Loyalty Program for Savvy Market Research » Red Mango Marketing! Most small business owners appreciate the value of a loyalty program. However, the word “loyalty” often blinds them to other benefits they can enjoy from these strategies. They think that if they can squeeze a few extra sales each year out of a punch card or some similar gimmick, that they’re doing okay. Frankly, they’ve only started to scratch the surface of what a good loyalty program can do for a small business. Consider the issue of market research. It’s no secret that small business owners don’t have the funds to do the kind of market research that large corporations are able to afford. However, if you step up your loyalty program, you can use it to mine some very valuable market research. With this information in hand, you can then make some very smart plans for the future of your business. Go beyond the paper punch card and get your program into a database. Central to gathering actionable market research is collecting contact information from your customers. Unlike with a punch card, when you collect contact information from your customers you can reach out to them and entice them to come back to your business. You can also collect important demographics and feedback through online surveys to really understand the buying habits and preferences of your customers. With that information in your database, you can begin to target future sales, adapt merchandising priorities, and maybe even come up with new business ideas. For example, if you saw that your younger customers overwhelmingly buy a certain subset of what you offer and there’s an area of your community that matches that demographic, you might consider opening a business in that location that specializes in those items. The flip side of that coin is to discover the things you sell that certain demographics seldom or never buy. Once you know what’s resonating with different groups of your audience, you can better segment email marketing by only sending information that is of interest to certain groups. The possibilities are endless, but if your loyalty program is still living in the punch card era, you’ll never enjoy its full potential. Be sure you’re getting all the value you can from your small business loyalty program. Looking for more small business marketing inspiration? Here are 10 Ways to Market Your Business on a Shoestring Budget. 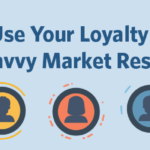 The post How to Use Your Loyalty Program for Savvy Market Research appeared first on Constant Contact Blogs. This entry was posted on Tuesday, April 26th, 2016 at 7:00 am	and is filed under Business Tips, Fresh Insights, News & Updates, Small business tips. You can follow any responses to this entry through the RSS 2.0 feed. Both comments and pings are currently closed.